Manic Monday is everybody’s worst enemy. It signals the start of another hurdle of a long week, a good 5-day marathon until the blissful weekends. Most of the people are dragging themselves out of the bed whenever Monday morning starts, but it shouldn’t be the case – Mondays should be greeted with a smile and a warm welcome for a great start! Repeat after me – ‘something wonderful is coming my way’. If you believe it, even Mondays will be so exquisite! Have a happy start of the week! Look on the bright side! If you start your week right, the rest of it will follow marvellously. Happy Monday! To be successful in life, you need to fall in love with everything you do. Start falling in love with the start of your week and the rest of the days will be surprisingly brighter! Happy Monday! I am not allergic to anything but whenever Monday comes a lot of symptoms starts to show up. I had a hard time dragging myself off my bed and I need an extra shot on my coffee. Friday won’t come without a Monday so I guess I have no choice but to face it. Happy start of the week, Monday warrior! One great thing about Mondays is an excuse for me to grab that extra cup of coffee for the rest of the day. Happy Mondays! The crazy ones are those who embrace the coming of the dreadful Mondays. You are not alone, everyone else in the world does! Happy start of the week, Monday warrior! Another chance, a new beginning – that is what Mondays are all about. Face it with great energy and a smile and the rest of the week will be beautiful. Make this first day of the week a great start. Happy Monday! You know how dreadful Mondays are for most of the people in the world? Why don’t you set yourself apart? Instead of frowning and yawning like the rest, hold your head up high and smile. Bring forth brightness into the Manic Mondays of those around you! Happy start of the week! 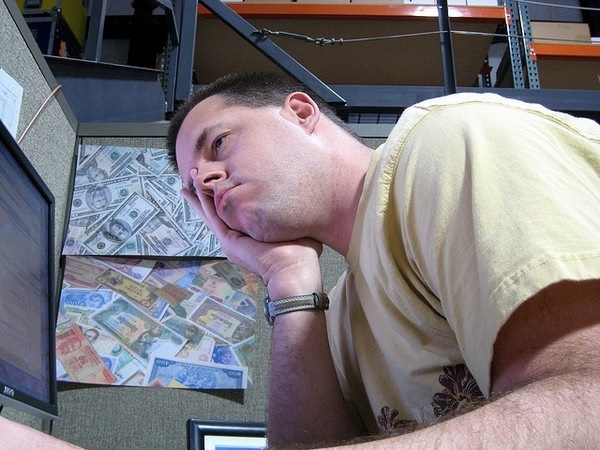 Oh, the traffic, the rush, the paper works, the tidal wave of projects – Yes, my friend, that is Monday. It wouldn’t be called Manic Mondays for no reason. I often dreamed for a quiet Monday with the steam of the coffee fogging my eyeglasses, a book cuddled in my lap and the noise of the world drowned against the thick glasses of my windows. 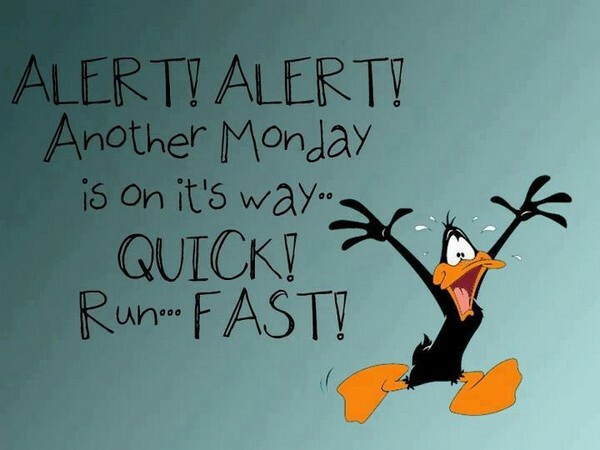 Wouldn’t it be such a delight not to join the rest of the world with the Manic Monday rush? One of the greatest challenges in life is getting up with a smile and a welcoming heart on a Monday morning and the courage to face the rest of the week with gladness. Happy start of the week! Be so happy and bright that when others look at you, their day becomes as bright and happy too! Happy Monday! Mondays are not so bad! Look outside. It’s the same bright blue sky! Look at you. It’s the same beautiful face! Look at your coffee, you can add extra milk and sugar as you please! Brace yourself! Monday is once again knocking on your front door. Don’t chase it away with a shotgun of hot nerves. Instead, welcome it inside your house and serve it with a tea of positivity. An extra dose of good vibes won’t do you any harm! 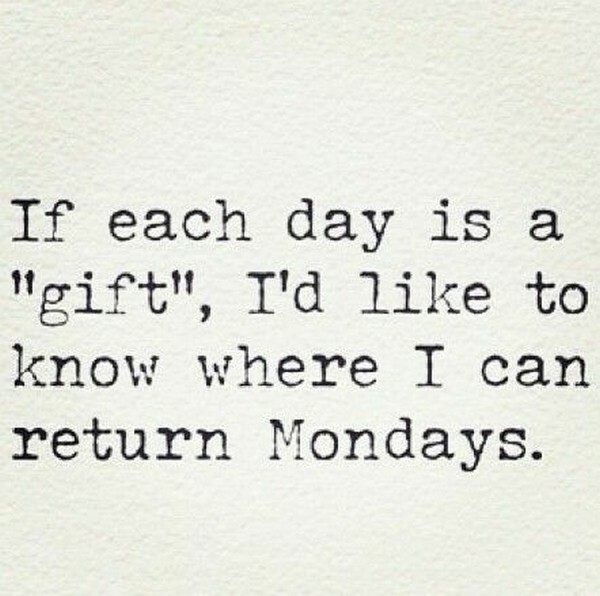 No matter how much everyone dread Mondays, I would still love it nonetheless. It is because of Monday that there is Friday nights and Sunday mornings. 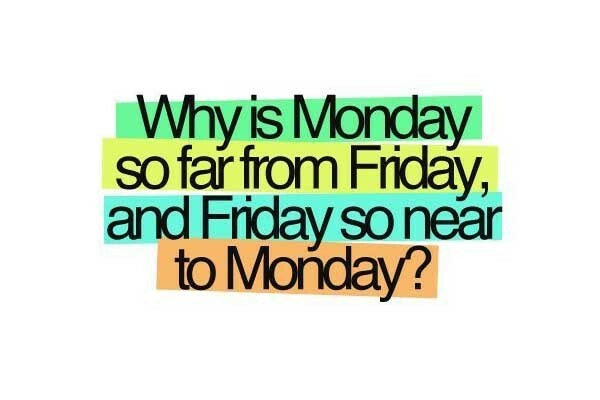 I just wish that there is one more day between Sunday and Monday though! If you want to start your week right, you have to treat Mondays more nicely. Rise and Shine! Face the day equipped with the best weapon against the assailing Monday – a powerful spell of sunshine, a shield made out of enthusiasm and a sword forged with happiness! Make your Mondays so beautiful that your Tuesdays turn amazing, Wednesdays be dazzling, Thursdays become wonderful, Fridays be so marvellous, Saturdays be adventurous and Sundays become so fabulous! Have a fantastic week! May your latte be sweet and your Mondays bearable. It’s Monday again! The chaos, the hassle, the noise! Are you ready? 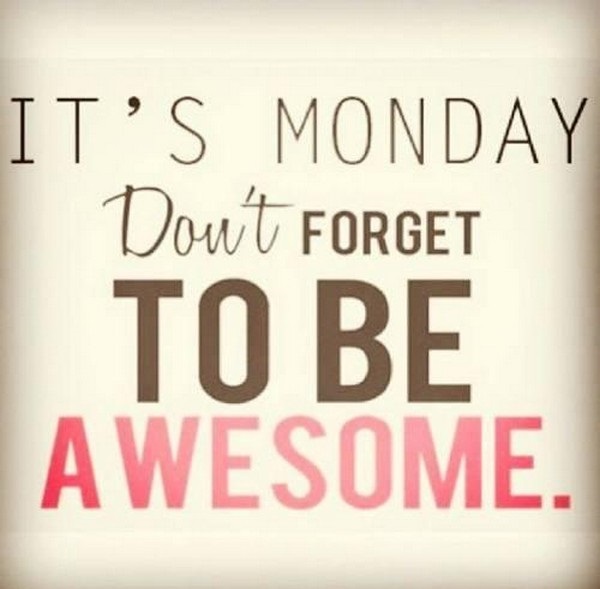 Don’t forget to be awesome! Dear Monday, we’ve been in this destructive relationship for years now. I need a break. I’m seeing Friday and will be dreaming about Saturday. Sincerely, it’s you, it has always been you. Dear God, please give the strength to face the start of the week with happiness and enthusiasm. I am blessed. I am alive. That’s all I need to keep on going. I am looking forward to the amazing things that will unfold this week. It’s an amazing day to have a great day! Have a great jumpstart Monday! Get up. Be Awesome. Be Kind. Survive. Repeat. If you turn your job into your passion, even Mondays would be as pleasant as a dive in the pool on a hot summer day! Although Monday is permanent, don’t worry! Our problems are surely not! The spilling bunch of papers atop your desk may petrify you, the insane traffic may test your nerves and everyone’s Monday face may bring your spirits down – always remember that these are just challenges to make your stronger. Happy Monday! Every successful person in the world has faced all kinds of Mondays – Good Mondays, Manic Mondays, Crazy Mondays, Insane Mondays. Think of Mondays as a part of your journey towards success. Without it, you won’t be as strong or as better than you were yesterday. Friday Nights exist because of Manic Mondays. It is an excuse and a reason to celebrate the grind of the week. It doesn’t matter what day it is. May it be the dreaded Monday, busy Tuesday, smooth Wednesday, cool Thursday, Party Friday, Relaxing Saturday or Bright Sunday, as long as you face them with a good attitude and positive perspective, any day will be a wonderful day. Even Mondays can be wonderful with a cup of coffee in one hand and a shopping bag in the other. 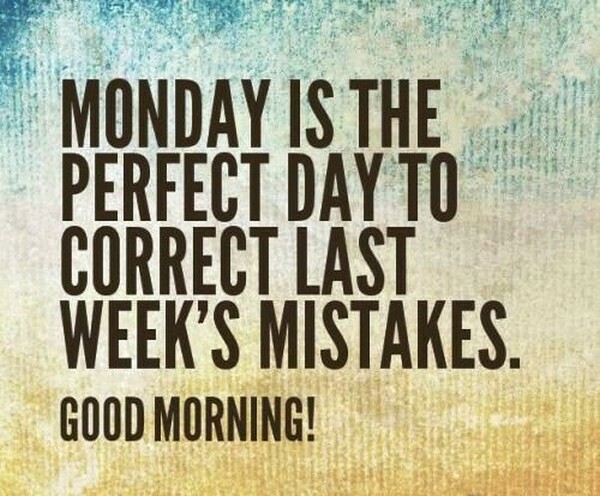 Monday is another opportunity to redeem yourself from last week mistakes and the chance to be a better person than you were yesterday. Coffee is the only thing that keeps me from hurting anyone on a Monday morning. Good morning Monday! Get ready for a crazy day at the office. Pump yourself up with that much needed energy to get through your start of the week. Make most of the day by! Love, laugh, read, dance, play and dream. The day is yours to take! Who doesn’t hate Mondays? But you know what, I get up and go to work. I complain, yes. But I have a job and that’s enough to make me feel thankful. Count your blessings, not your tragedies! Happy Monday! What’s my healing potion after a merciless Monday? Indulging in a good quiet café, a prayer and a book to relieve me of my stressful day. The secret to a great week is to start it brilliant. Spread happiness around you! A sprinkle of positivity would not hurt. Have a great Monday! If you are falling apart, see Monday as an opportunity to rebuild what you’ve lost. It’s a new day and it is yours! Instead of calling it Crazy or Manic, why don’t you call in Inspiring Monday? That way, it won’t be as painful for you to get up on a Monday morning. Have an inspiring Monday! They say that 10% is what happens to us and 90% is how we react. It is just like Mondays. The rest of the week is 10% while how we react to Mondays tells us 90% of what the outcome of the rest of the week is. Let’s just get over that slowest 8 hours of the day. I need a sandwich of courage, a steaming cup of optimism and a wonderful slice of brightness to get through every Mondays. The only way for me to love Mondays is if my day offs fall on those days. That will be the greatest betrayal for people who have a normal weekend days off. Mondays will be my favourite day of the week. Monday, my friend, there’s nothing you can do for people to love you. If you are fall during Christmas day then somehow people will love you. I need a double dose of my coffee and happy pill for this week. I’m ready for you Monday! Bring it on. The secret to a happy Monday is to surround yourself with positive people. Be grateful to have great people around you to repel the negative energy. Remember, you have your family and your friends at the end of the day. Happy Monday. Just be who you are and everything else will be beautiful. Even Mondays won’t be as dreadful.